Among Women 150: The Rosary and Pregnancy – Perfect Together! This week’s episode: Our 150th episode!! Just how do the rosary and pregnancy go together? Well, they both nurture new life in us, both spiritually and biologically! In our guest segment, I talk with longtime friend of AW, Sarah Reinhard, and we share themes from her new book, A Catholic Mother’s Companion to Pregnancy: Walking with Mary from Conception to Baptism. We talk about how the Blessed Mother assists and inspires a woman during the stages of pregnancy, and in preparation for having a child baptized. See below for our free drawing to win a copy of Sarah’s book. Be sure to listen all the way to the end of the podcast to join me in praying for the storm victims in the Northeast. 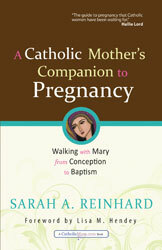 Sarah Reinhard’s book A Catholic Mother’s Companion to Pregnancy: Walking with Mary from Conception to Baptism. AW 11: with Sarah Reinhard on her first visit to AW — one of our earliest episodes from 2009! Enter our free drawing for Sarah Reinhard’s book by sending your name to Pat Gohn at amongwomenpodcast@me.com, or to the Among Women podcast facebook page.